I’m now on my second Apple Mighty Mouse thanks to my good friend Andrew. My first Apple Mighty Mouse came with my iMac and worked great. Well, it worked great until some dirt built up under the small scroll ball and scrolling came to a halt. I attempted cleaning the wheel with some alcohol but the smooth scroll never returned to that mouse. Now I have a brand new Apple Mighty Mouse. Opened the box and plugged it in this morning excited to have a nice functional mouse again. Immediately I noticed that scrolling worked great when I scrolled down a page. But the mouse would not scroll up! This almost makes this mouse useless. I’m very disappointed at Apple for this design. 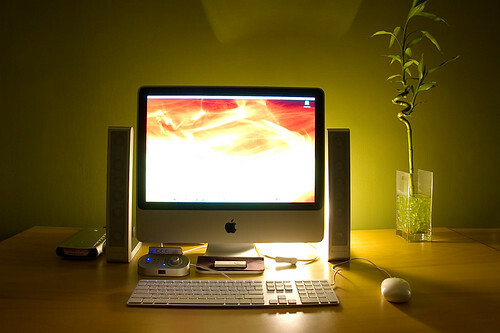 My friend Jared pointed me to a post that he found on Digg which shows my 20″ Intel iMac setup that I posted to Flickr. The original article is on techZilo.com. I must admit, I’m still quite happy with this setup. I watched this movie over the weekend. I’m a sucker for documentaries and such. It was very interesting. I remember back around 2000 a co-worker told me his mom had leased an electric car. And I was always curious if these cars had heat and air-conditioning. Anyways, I didn’t hear too much in the news or advertising regarding electric cars.Now this movie sheds some light on the situation. Let’s look at a few things. Infrastructure for fossil fuels: Fossil fuels are running out and fuel prices are steadily rising. We have this backbone already in place but hurricanes still take out refineries and oil rigs. Wars slow the import of fossil fuels. And there is the environmental impact on obtaining fossil fuels. Infrastructure for hydrogen: Until there are as many hydrogen stations as gas stations in our country this just isn’t going to work. You would need to plan every trip around where you could fill up. And I believe the current process of creating hydrogen uses more fossil fuels than if we just used fossil fuels to begin with. Infrastructure for electricity: It is already here. It’s in all of our homes and businesses. Now we could always work on the way our electricity is generated. Let’s try to get away from coal and move towards hydro, wind, and nuclear. Some people say that the electric car can’t go far on a charge and is not very fast. This is not true. Look at the Tesla which gets 220 miles per charge and goes 0-60 mph in 3.9 seconds! Just imagine what could be done if all of the big motor companies were working on developing electric cars and were not being funded by the oil companies. The automobile companies like to say that there is no demand for electric cars. But maybe that’s because there is no advertising drive done for such a vehicle. That’s what happened to the electric cars of a few years ago. They didn’t advertise them and then said that there was no demand. But that is exactly what advertising does. It build demand for a product. If the auto companies really wanted to sell these vehicles all they needed to do is market them. In fact, after the auto companies pulled their existing electric cars from their leases, they sent them to be destroyed. Protesters stood outside these lots and raised over 1 million dollars to purchase the remaining 70 cars. But they were denied. In fact, they had a waiting list with several thousand people who wanted them. Something I learned and didn’t really think about until after watching this movie is how this would effect the parts industry. It would certainly hurt the parts carriers as electric cars did not use air filters, oil filters, motor oil, and other maintenance parts that the average car uses. This makes any maintenance on electric cars minimal and umm… clean to work on! On a related note. The X Prize Foundation has recently announced the Progressive Automotive X Prize with $10 million dollars to be won. This contest will award $10 million dollars to the first team to bring a car to market that gets 100 miles per gallon. So far none of the large auto makers have shown any interest.